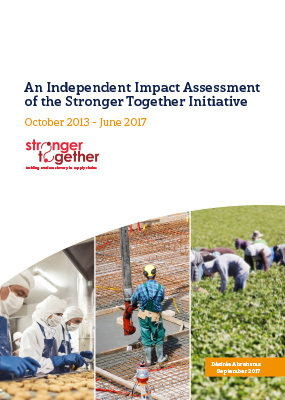 An Independent Impact Assessment of the Stronger Together initiative analysing the impact of the programme from October 2013- June 2017. Based on an online survey conducted with suppliers in the UK consumer goods sector the report includes key findings and future recommendations. A range of open interactive workshops offering practical guidance to help businesses prevent modern slavery. Engaging and interactive, our e-learning modules provide a flexible and cost-effective training solution for your workforce enabling learners to complete at their own pace and location. Find out more about Stronger Together and what we do. Stronger Together is a company limited by guarantee, registered in England and Wales (Company Registration No. 11598061), registered address Camberley House, 1 Portesbery Road, Camberley, Surrey GU15 3SZ, UK.